Several studies have continued to show that a caring, involved adult keeps youth on a path of success. In fact, the 2015 report “Don’t Quit on Me” said, “The more sources of support young people have, the better their chances to graduate high school. “ The key finding of that report showcased that a stable, trusted adult can be the anchor that connects a student to community resources and assets to be successful. 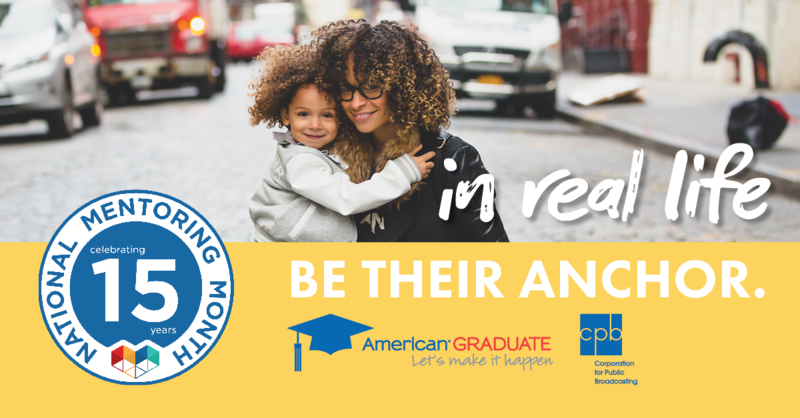 January is National Mentoring Month, and American Graduate is celebrating these champions who have already helped students across the country, but also encouraging more adults to become a mentor. Find resources to become a mentor in your local community here. Across the country, public media stations – through their work on American Graduate – are telling the stories of these American Graduate champions and the importance of mentorship in their community. American Graduate Day co-host Sheba Turk thanks her real-life mentor, fellow co-host Soledad O'Brien, for helping her in career and life during the 2016 American Graduate Day broadcast. Elmo & Alan of "Sesame Street"
Alan helps Elmo understand the meaning of what being a mentor means. Singer Rachel Platten discusses her teacher who inspired her to enter music and how she influenced her life in this short clip. Broadway actress and singer Phillippa Soo discusses the importance of mentoring youth in this short clip. Previously, Nine Network of Public Media's program "Living St. Louis" introduced the world to St. Louis Public Schools Dropout Recruiter Charlie Bean and his job to help bring kids off the street and back into the classroom. Producer Anne-Marie Berger catches up with him in this below segment. Learn more about Nine Network's local efforts on their website. This video features a group of young men of color who normally don’t have prime time television exposure. It’s a very personal and candid conversation with young men striving to overcome the obstacles they face. Joining them are the organizations dedicated to helping, as well as men who are in the process of becoming role models. Learn more about New Mexico's local efforts here. Sam Corbett is a problem solver. When he was an executive in the formalwear business, Corbett had to find creative solutions for a business that revolved around immovable deadlines like wedding dates and proms. When he decided to leave his family business, Sam Meyers Formalwear, Corbett followed a yen that had been building in him for years: to continue his involvement in education. Learn more about the local efforts of KET on their website. Jasmine Roman is excelling in high school despite her challenging circumstances. Her story highlights how a positive, caring mentor helped her overcome obstacles and achieve her dream of attending college. See the WORLD Channel American Graduate collection here. A professional engineer returns to high school several times a year-- to encourage students to graduate and enlighten them about how to succeed afterwards. Learn more about NPT's local efforts here. For more than 100 years, Big Brothers Big Sisters has made it their mission to provide children facing adversity with strong and enduring mentors. WFYI and the American Graduate initiative are proud to recognize this organization, and in addition the story of a Big Couple. In this video, Gwen and Bryan Langley and their little Kennedy share with us their success story and champion how much their BBBS relationship has enriched their lives. Learn more about the local efforts at WFYI here. Kia Sweeney helps young women transition from high school to college. Kia’s program, the “Girls Group High School and College Program” in Ann Arbor provides mentors and guidance for students in grades 7 through 12. Learn more about the local efforts of DPTV here.